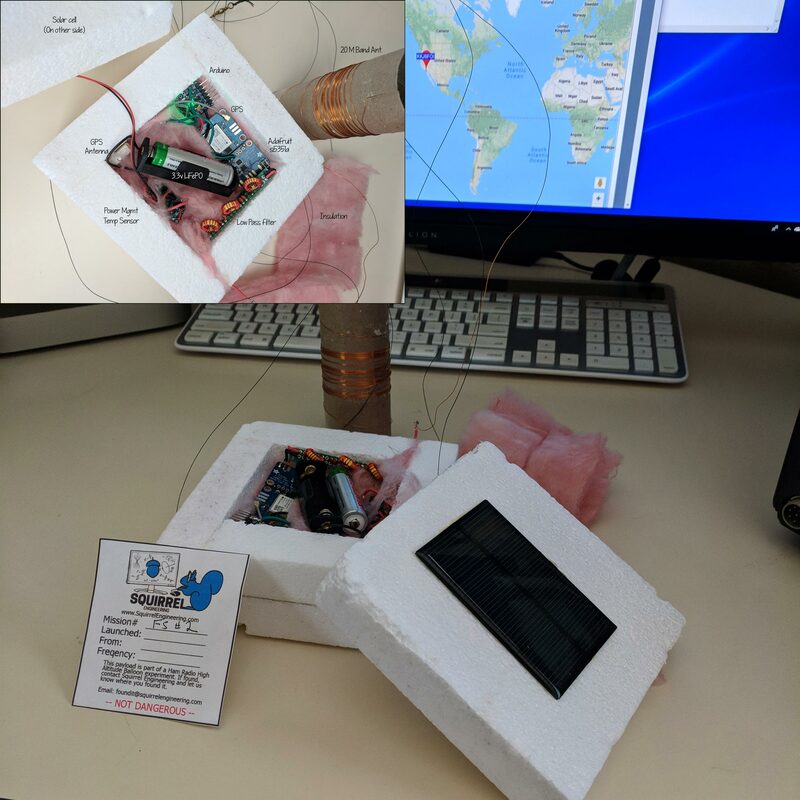 Flying Squirrel #2 (FS2) high altitude balloon is planned for launch the morning of May 19th 2018 at 10AM (approx.) from Lucerne Dry lake bed in Lucerne Valley, CA. FS2 will send telemetry using WSPR to send 6-digit grid squares and uses the FSQ data mode to send more detailed position and telemetry data. All telemetry is sent on the 20-meter Ham band. The FS2 payload is an Arduino (3v) pro micro microcontroller, u-blox Neo 7m GPS and an Adafruit si5351A breakout board (radio.) The payload also includes a ds18b20 temperature sensor and power management circuits. The antenna is a 20-meter dipole with the flight payload suspended below one half of the dipole and the other half dangling below the payload. Output power is 20mw. FS2 is powered by a 400mah 3.3v LiFePO battery and solar cell. Total payload weight is approximately 90 grams. Lift is provided by a 36” latex Helium filled balloon. The predicted winds on May 19th are light. This favors a flight plan with a sudden rise (high lift) in altitude until the balloon bursts followed by a fall. With the light winds and an estimated (Actually a wild guess) burst altitude of 20,000 meters, the balloon will remain within Eastern California and it is feasible to recover the payload after flight. Check the SquirrelEnginerring.com website for the most up to date predictions until launch. FS2 uses standard WSPR mode transmissions on 20-meters to send its current 6-digit grid square 4 times per hour. The WSPR callsign is KJ6FO/B. You can listen for FS2 on WSPR or follow its progress on WSPRNet.org. Use the 30-minute setting on the WSPRNet.org Map to get up to date information. The FSQ Telemetry data will be relayed from mobile chase stations (AKA Ground Squirrels) to the APRS network. You can follow the progress of the flight on aprs.fi The APRS callsign for the balloon is KJ6FO-11. FSQ Telemetry is sent on the odd minutes of the hours when not busy with WSPR transmissions. See the telemetry schedule for details on times and frequencies. Any reception reports will be most apricated. Please send reports to the contact information for my callsign KJ6FO published on QRZ.com. Visit the SquirrelEngineering.com website or our Facebook page for more information on this project and flight updates.